Great day starts with a motivational conference call for entire sales team including daily contest that allows you to win cash and prizes. Then we get after it calling customers setting appointments and making presentations. Simple and easy is what we do. I've learned that regardless of what is being sold some will some won't but just keep moving forward and reaching those who will. Managers are the best. Our managers are always available to assist in anyway even if they're not your direct supervisor. Co-Workers...Oh my gosh you'll never find a more friendly and fun bunch of team members. They go out of their way to help anyone new or veterans. There really isn't a part of my job that I consider hard. The most enjoyable part of the job is the continuous training that has helped me advance into a management role yet I still have leaders who are coaching me for further success. This company is about success for anyone who wants more than a ordinary job. If you’re willing to put in the work, take coaching, and follow RTN’s proven sales process, you will make money. Yes, it’s hard work. Yes, sometimes it’s long hours. Yes, sometimes it’s exhausting. But if you live for closing and want to write your own paycheck, RTN is the place to be. Cold calling lots of people per day with no structured territory. Tend to hold a contract to not pay you on time. Commission only and is low. If a customer does not pay their bill you have to pay back the commission instead of them going after the legal contracts. Jump on for a company call at 8 am, its a great call I learned the most from these calls. You will participate in some roll play, also learn whats working from other reps. There is very little supervision, you need to be a hard working individual that has lots of initiative. I liked the fact that there was very little micromanaging. Management was the best part of this company. I could call my regional manager at all hours of the day, and get mentor ship or assistance with a problem. Even the Vice President leaves his number open to call for help. This is the time to join the company, it is growing fast. It seemed every week there were more and more people joining the team. This created several advancement opportunity's. One of my goals was to become a manager. The company worked with me and help me set clear goals on achieving this. I became a trainer which I really enjoyed helping new reps learn and grow. The company has a company wide chat app which made the day exciting, also motivating me seeing reps close big deals! The hardest part of the job is the cold calling. My advice is learn from the other reps, find what works for you to gain as many appointments with fewer dials. I choose to leave due to family issues, and other state opportunity. Although would go back in a heart beat. This is by far the best company I have worked for! Everyone from your manager to the Vice President are here at your call to make sure you succeed! Work and life balance can be challenging only if you can't handle the independence of not reporting to a office everyday. Your hard work makes you great money!! I've been with the company 4 months working out of the Charlotte Region---and this is one great sales company---pure sales company that believes in rewarding their sales reps! Managers motivate and inspire daily----they want you to make money and I'm making money. The product is fantastic and gets results for our clients as well as solid ROI. I enjoy the team atmosphere and my boss is just the best. Wish I had found this company 5 years ago. They only pay $200 a month for gas and that needs to be more. great earning potential. Management is there for you on a daily basis. Follow the program and you will be successful. If you enjoy outside cold calling sales, this is for you. There is high pressure to make calls and set appts and sell ads. I've been at RTN for several years and the one thing that I can appreciate about this job is you get paid exactly what you're worth. If you are willing to listen and work hard the sky can be the limit but if you're stubborn and lazy you will not make it long term. The best advice I can give anyone who wants to make it is to come into this business with an open mind - forget what you've always done at other companies because chances are it won't work here. We have a proven process that if followed will make you thousands of dollars in commission. If you want a job where you can get on the fast track to management this is it! There is no seniority here if you're willing to put in the time and effort you will be rewarded. RTN is a great place to work and has amazing people to work with as well. I have been with RTN for two years now and I am glad to call this home. I had started off with minimal experience and with excellent training, support and coaching throughout; I have been promoted within the company! RTN has given me the opportunity to prove myself and be rewarded for it. We are about the numbers, but we are about having fun too. Management is very supportive and communicates with all departments of the company. If you’re looking for the opportunity to make money based off of your performance, I feel like this is the place to be. Management Understands people have lives outside of work, the work life balance at RTN is ideal for me, finally a company that realizes that people have responsibilities that fall into “banker’s hours”! An ever changing environment. We are continuously adjusting and adapting to the current market needs, which brings change. It can be challenging at times but with the great team atmosphere here, we go with the flow, quickly grasp the new game plan and rock it! I actually love this company, my managers were some of the best leaders i've had the pleasure of working with. The pay is structured to make you really work for it. I would of continued to work for them if life circumstance didn't require me not to travel. This company really needs an overhaul! Management is terrible...they work with you one half day then throw you to the wolves. They make promises they don't keep. They dont return phone calls during the day. I wasnt sure what they were doing all day.The product is nearly impossible to sell. Price is too high, everyone has tried it and it didnt work.Seems to me as if they hire people and set them up for failure. Way to many to name. I studied media sales in college and always wanted to dabble in it and see if it was a good fit for me. Coming back to work after raising my boys, I saw an ad for ShopperLocal to sell advertising on register tape. I had noticed the coupons and ads and thought the concept brilliant. They offered me a job. I went through the training impressing everyone there, but when I got out in the field I found it very difficult to re-sign former customers because of shady dealings. First I thought it was just a bad rep in that area. Then I was hearing horror stories from every company that had dealt with them in the past. Some said they tried to sue but their lawyer said it wasn't worth it. Then management told me our name had changed to Register Tape Network and that we had been bought. Come to find out, they flip the name back and forth every few years and say they were purchased to try to get back into markets they have a bad reputation in. This is a fun place to work but has a strict work environment. There is not much room for mistakes to be made. Communication between owners and managers and employees is not very good. You are supposed to know what is expected of you even when it changes day to day and figure it out for yourself. Overall the regular customers are great and it is a nice place to work if you can handle the ever changing rules and other changes within the workplace. discount on food for employees, nice work environment, friendly atmosphere. I've been with the company for several years - for me and my family this has been a life changing opportunity but you know what they say anything worth having isn't easy to get! When I took this job I never dreamed it would become a career and I had no idea what I was doing but I was open minded and listened to my trainer - I memorized the script and after training did exceptionally well. I've earned more money than I ever thought possible and have been able to maintain my income for several years. Just like with any marketing this program isn't for everyone however if the customer gives us a good offer the results are excellent! The biggest con I've seen people post in their reviews is learning a script, micro managing, and being expected to work. As a manager I can attest the script works we've literally sold Millions of dollars of advertising using it none of it is new its just what has always worked in our business. The only people I micro mange are the ones who don't work and at the end of the day this is a sales company - you get paid what your worth if you're willing to listen and work hard the sky is the limit if you are lazy and stubborn your tenure will be very short lived. Taught me how to deal with putting out fires quickly. You deal with a huge range of personality types, so you get comfortable working with all sorts of people *fast*. I left a while ago, so it would be unfair to list some of the issues at the time I was employed as they could very well have been fixed by now. One con was the health benefits (cigna at the time), which didn't cover much and would have been way too expensive to add any family members to. Always keep the lines of communication open; never let anyone fear that their job is at stake if they speak up about a concern of theirs. 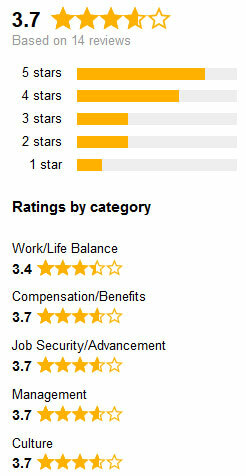 ShopperLocal is a nice place to work. They pay well, condition is that you work hard. There is no place for people who have a tendency to crib while those who want to learn are grow are appreciated abroad. There are a few flaws within the organization which hamper the overall effectiveness of the operations. The communication between departments is not streamlined; this can be very harmful especially for the agents who have to handle the customers. Please streamline the communication process so that it becomes easier for the agents to work. They allow you to take on as much responsibility as you can handle. My co-workers are greatâ€¦unfortunately they donâ€™t hang around long! Take and receive calls, Make several calls to potential clients. Management would teach you how sell to customers. The hardest was trying to convince clients no there still no outcome. Overall Good Company with poor local management. Owner puts forth effort to make his employees happy, however with company located out of NY State. Management is very poor. there is a huge emphasis on training. Our new hires are given all the information they need to succeed. The training manual is updated regularly and real experiences are shared with the group. In short, everyone is given everything right from the start. with how fast the company is moving, a lot of new people fill in old and new functions in in a short amount of time. It takes some time to get used to the speed of how things move. Ability to make an above average income...1st year 80k plus, 100k plus the next and beyond. Of course this is without a complacent attitude! We must be persistent and open minded to coaching(learning and changing when necessary) to make our skill sets and income better. We have the opportunity to self manage if in fact our results dictate that privilege. I cannot think of any at this time except we are a newer company and I would love to see some kind of company match on the 401k. Love you all and let\'s grow into more states and offer this awesome opportunity to others! Contact small to medium business owners within a 5 mile radius of an assigned store (Albertsons, Kmart, Cardenas, Family Dollar, and Superior). Meet with the decision maker of the business, through a serious of fact finding questions decipher whether our medium of advertising is a good fit for said business. It usually is, as all mediums of advertising are beneficial if nothing else than as a branding tool. Explain the benefits of partnering with our stores in distributing the "message" of said business within the target market of their customer base. This company has a lot of growth opportunity. Sales reps are given a base salary and uncapped commission. Also, the company allows for gas and phone allowances. You have to sell to be successful; it is not a walk in the park. If you can master the sales process and do it the way its been proven then you can and will make money. Training is available and the managers are always helpful. Great people to work with. Friendly completion within the company, top sales reps get to go on trips! Small business can be a challenge to sell to. the cold call dialing can be difficult. Working for Shopper Local was rewarding because I was able to introduce creative marketing to clients. I was solely responsible for client generation, follow-up, and retention. I was able to consistently build upon my sales skills on a daily basis. I enjoyed working for this company because they encouraged individual autonomy. I've worked for ShopperLocal since 2010, and it has been a smooth road ever since. The workplace is very user friendly, especially when it comes to my sales supervisor. As long as the target is being met, there is incredible flexibility given to the employee. The management shows adaptability if an employee wants to use their own methods to get the task done. Over and all it is a good company to work with. Selling advertising on register receipts is a great concept that I wish more people would buy into. I worked from home and really enjoyed it. I helped the field sales team with questions and 3rd party closes. I had great benefits and was sorry to have left. This job let me meet new people every day. I was able to quickly build strong relationships with my clients and help their business excel. Cold calling daily for leads and appointments. Meeting customers face to face to sell print advertising. A day at office is quite hectic and thing can go haywire at times but the support of my colleagues and manger have pulled me out very serious mistakes. I had the delight of working with them for 6 years and it has been a road trip with its high and low point but the experience is magnificent. Hard to take a day off. You can't get one to just chill out and cool down which one needs at times. It's tough at ShopperLocal but that is exactly what keeps me hooked on. Everyday is a new challenge, every deal is do or die and the going gets tougher once you start getting big clients. But, the incentives get bigger, the rewards get larger and you wallet gets thicker. At ShopperLocal, the love to face challenges is what keeps you going and growing. If you don't have that fire to redefine each day and make it bigger, you can't survive a week here so this company here is not for the faint hearted. This is a place for warriors. When the tough gets tougher, only a warrior at heart can find the will to pave the way toward success. ShopperLocal is not for the faint of heart. You have to have an iron will to grow. Survival is not even a valid term here. Either you grow or you decay, there is no grey area. But, you grow really fat and hard word is never left unnoticed. A great place to work. During my term of 1 year, I am yet to come across any negative aspect. Some people define competitive environment as "too much pressure" but then again, ShopperLocal is not for the faint of heart. Incentives, Work Culture, Flexibility. The opportunities to express yourself in ways that other organizations would consider too unorthodox. Immense freedom with practices. With great freedom comes expanded responsibilities and accountability so work pressure can be immense. But if you need to do it your way, you will find the will to deal with it. Keep us the great work. Things have been turning beautiful for us since the little time after I joined and very soon we will reach new heights. I started with this company almost 6 years ago with no sales experience and it has been a priceless learning opportunity. I have personally made 70K + per year while selling this product in the field. It does take HARD WORK however. Reps who leave negative feedback are reps who aren't willing to work hard. Yes, it is sales and it takes WORK. This product is not going to sell well using former sales tactics. There is a thorough training program in place for a reason. This is a very fast sales cycle and the rep must be willing to follow a sales program, proven to produce success if they want to be successful. I have been successful in selling this product for years because I follow the training program. There have never been any deceit regarding my commission or paycheck. There has never been a mistake on my paycheck and I have never been paid late. I enjoy my work environment and have great senior management. The company has gone through some changes on the customer service side and communication between customer service and customers does need some improvement. My only advice to management is to hire reps that are truly willing to work, not reps who are expecting to earn a paycheck regardless of activity - this will weed out a lot of negative feedback. Keep up the great work! Even though this company has been around for many years, it shares many positive characteristics with start-ups. 1) Upper management is not only approachable, but they are open to listening to ideas and suggestions. 2) If you are willing to work hard, then there is a place for you. Top-down communication can be slow at times. The product is a fit for the right buyer and that is what we do is find the right buyer. Great true sales position where NO ONE gets in your way. Company is very open to listening and making changes to keep up with growing sales and team. Always someone there to help if you need it! Cannot think of any-- doing their best to keep up with a lot of growth is a challenge but a great issue to have! Continue to have an open mind and listen to the team! A very stable work environment. Full of youth and brimming with energy. Incentives are good and managers are quite co-operative which makes working here very comfortable. Pressure can be very high sometimes and it can get quite harsh during a dry spell and communication is not up to the mark which can hamper performance drastically at times. It's a good that that managers understand this issue and show leniency. Out of town travel could be a problem. Most reps travel at least 50% of the time. I'm used to it from prior outside sales positions. You have unlimited potential if you are a good salesman. You don't have to be amazing, just open minded and follow the system they provide for you and train you with. You could literally make 6 figures your first year there. The demands are hard, however not impossible. You must be able to work independently and have thick skin. You get tons of people telling you 'no' than 'yes' but that is normal if you are in the sales field already. Ask a question about working or interviewing at RTN. Our community is ready to answer.